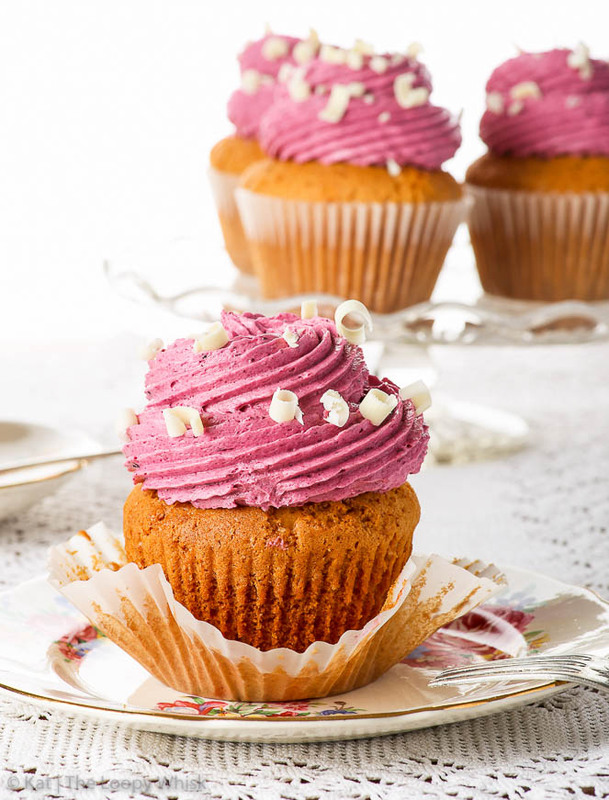 These white chocolate cupcakes with blueberry buttercream will impress both with their flavour and their appearance. 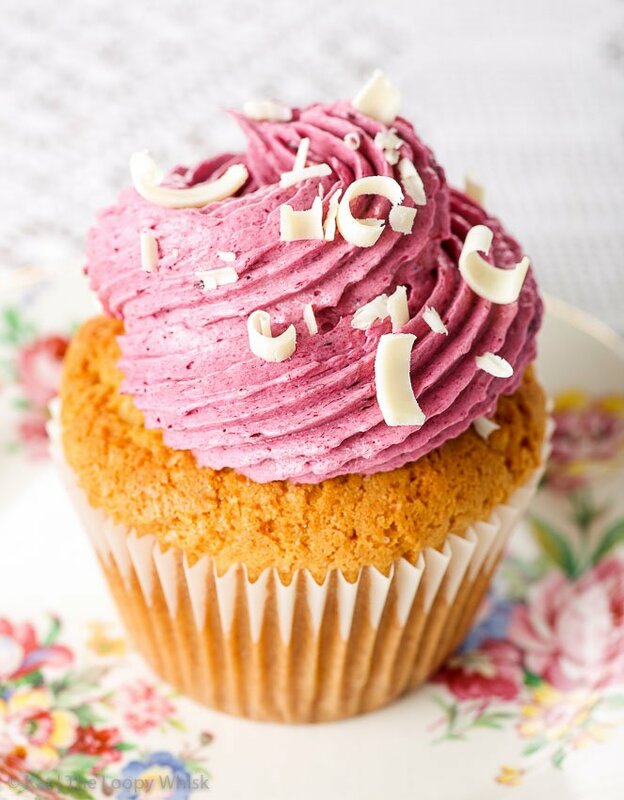 The blueberry and white chocolate flavours complement each other beautifully, and the textures are just as exceptional – with the cupcakes being soft and moist, and the buttercream fluffy and creamy. 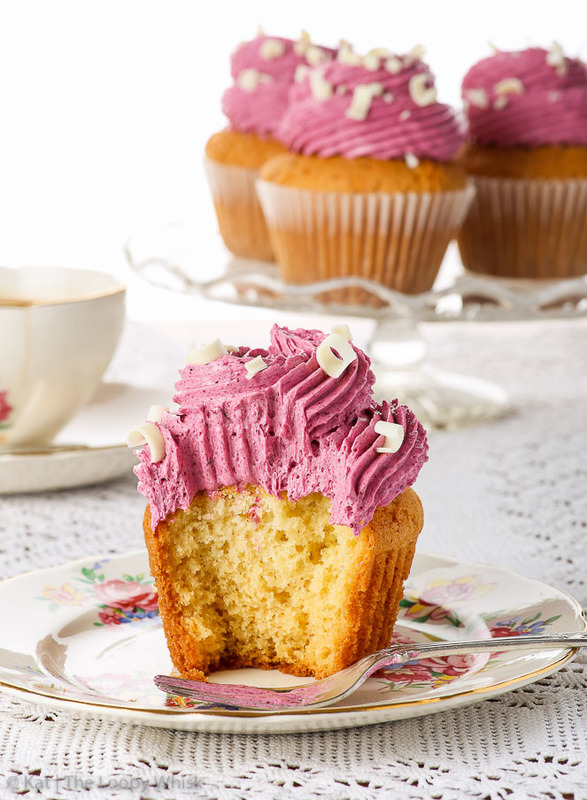 This white chocolate cupcake recipe is super reliable, easy and quick – just the way we like it! 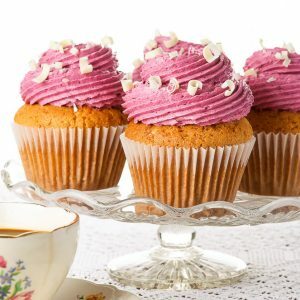 Cupcakes are one of those ridiculously photogenic desserts that always look insanely appetising and dainty and pretty… so long as you get the piping kinda right. And let me tell you, piping the buttercream in a way that doesn’t look like an elephant has sat on it is damn difficult with too small piping nozzles. 18 mm open star nozzle. Let me tell you, this thing is huge! Apparently it’s also ideal for piping eclairs… but that’s very much (very much) a work in progress – French patisserie is a pain in the… You’d be surprised in just how many ways baking choux pastry can go wrong. So, so many. 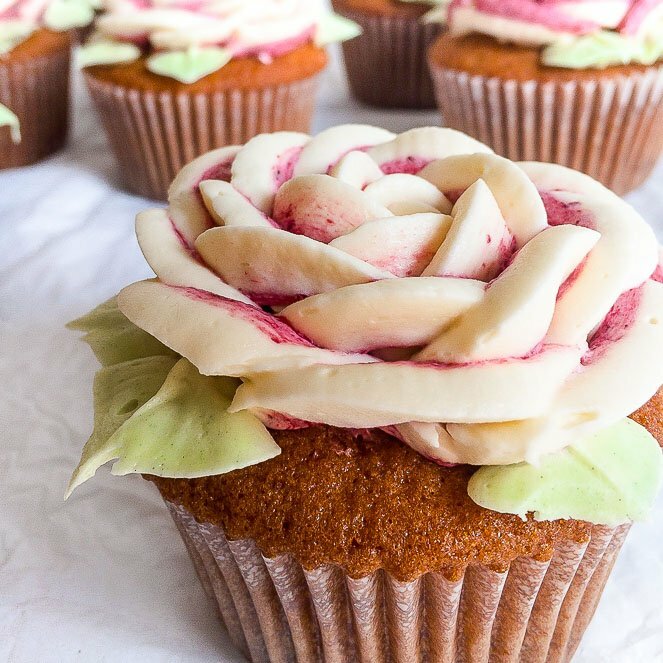 Anyway, let’s focus on these delicious white chocolate cupcakes. 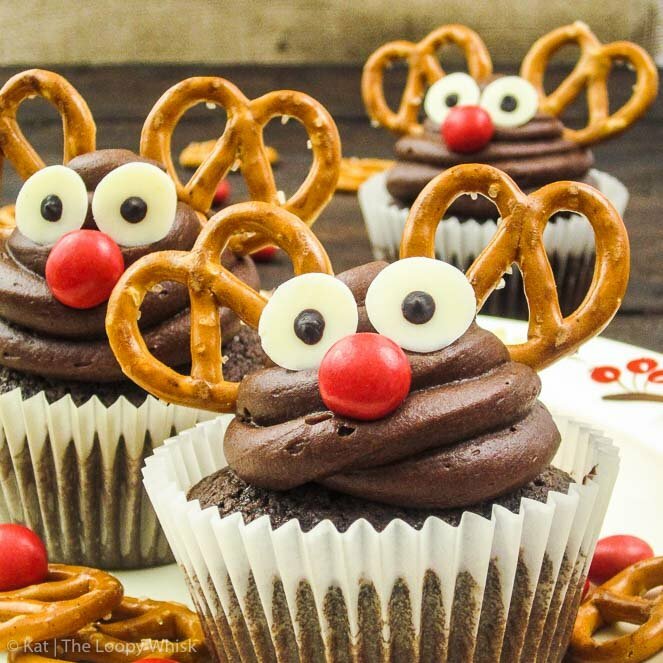 They are pretty much everything you might want a cupcake to be. 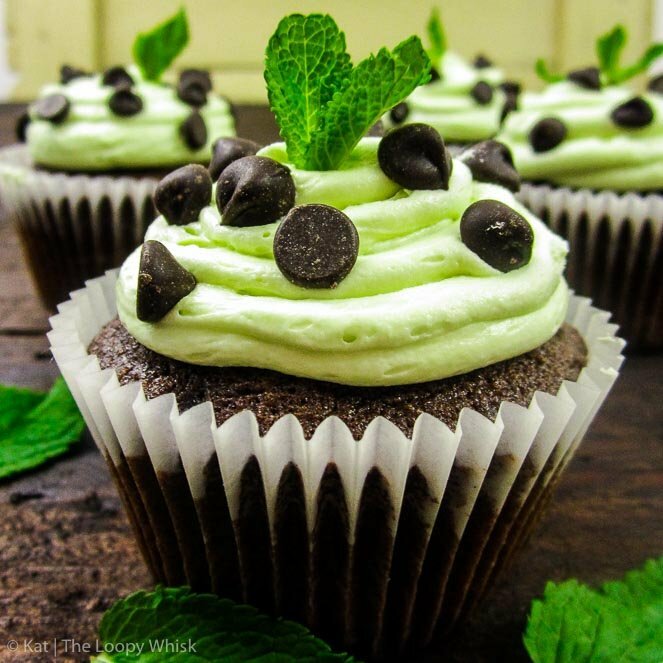 The cupcake itself is fluffy yet moist, and just the right amount of sweet. 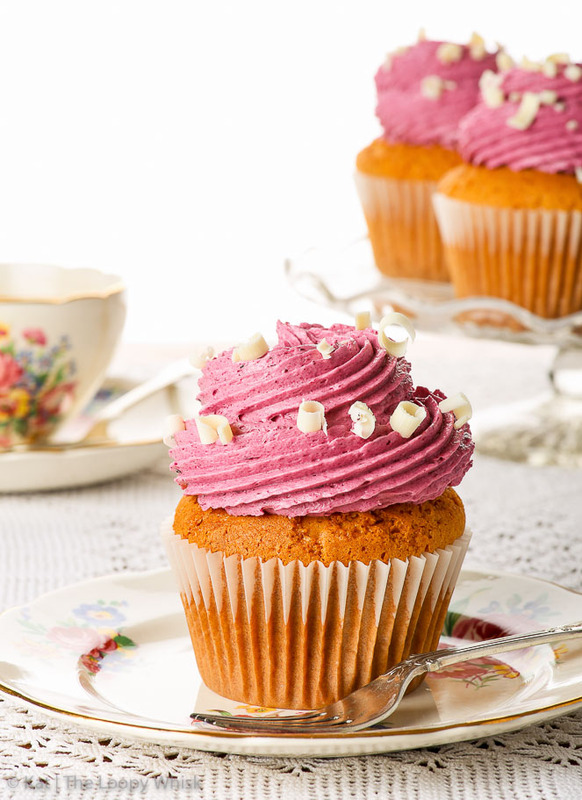 The white chocolate in the cupcake batter isn’t overpowering, it remains delicate… and simply divine. The blueberry buttercream is creamy and fluffy and sweet and so yummy. And you can definitely taste the blueberries, which complement the white chocolate beautifully. And what’s better – there are no artificial flavourings or colours! It’s just good ol’ blueberries (we totally love them, remember this and this? ), which are cooked and their juice reduced until you get a thick yummy jam that you strain to remove the blueberry skins. Simple yet effective. Simplicity is often the way to go to achieve a nice elegant finish. 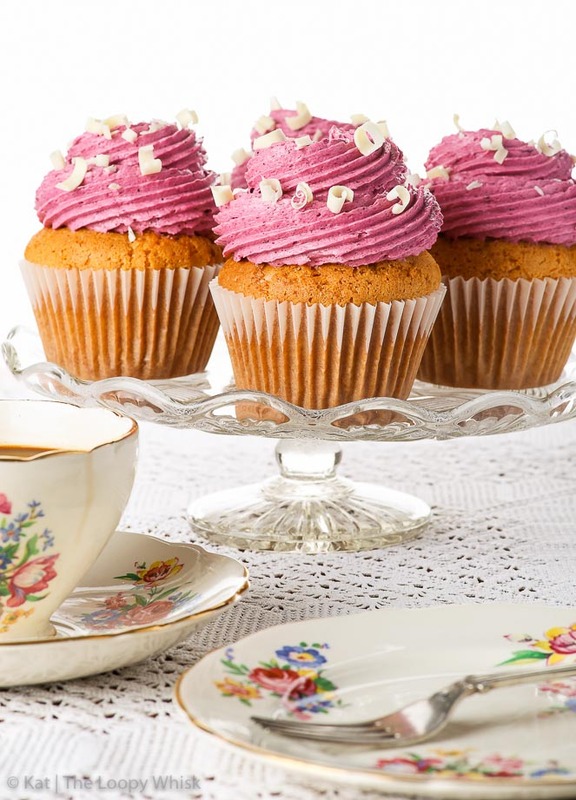 These white chocolate cupcakes wouldn’t be out of place at a posh afternoon tea party, and yet they’re really simple to make! 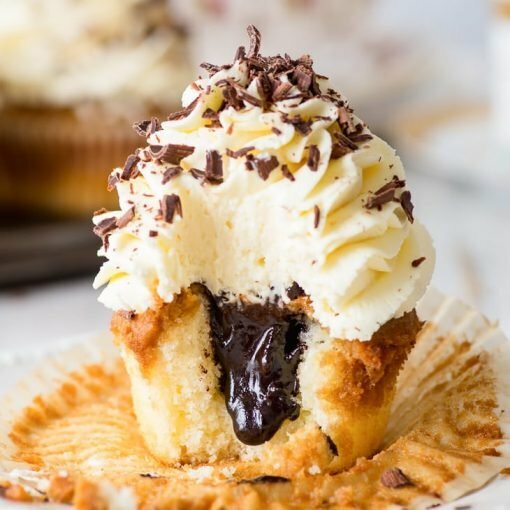 The flavours aren’t unnecessarily complex and the decorations are super simple (the white chocolate shavings look good and also pack a flavour punch) – and yet the cupcakes will blow you away with both their appearance and their taste. 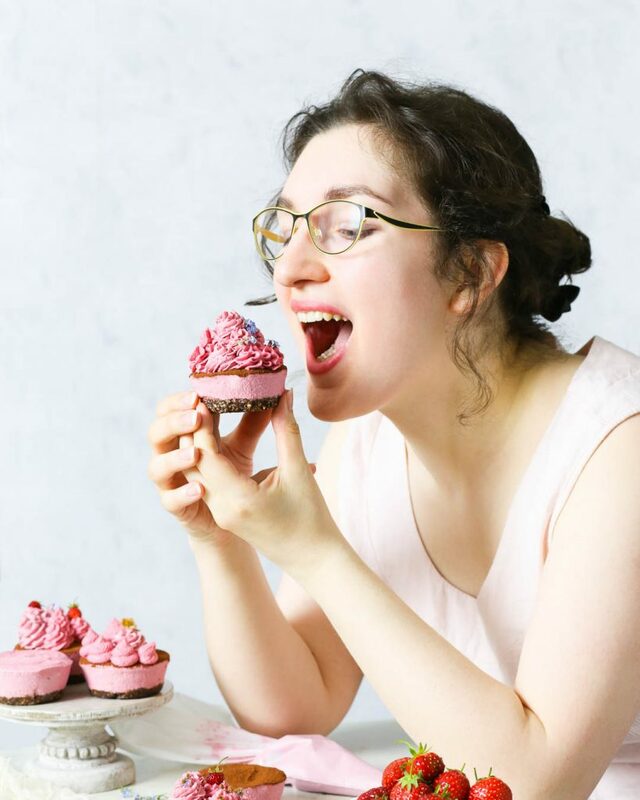 Whether it’s for a party, for a friend, or for your own enjoyment – I cannot recommend these cupcakes enough. They are prepared in no time, easy to make, and every bite is a taste explosion of white chocolate and blueberries. And if your piping isn’t quite up to scratch yet… white chocolate shavings. Or sprinkles. Sprinkles make everything better. In a bowl, melt together the butter and white chocolate, and allow to cool until warm. Add the caster sugar and mix with a whisk, a hand mixer with beater attachments, or a stand mixer. Add the eggs, one at a time, mixing after each addition until fully incorporated. Sift together the flour of choice, salt, baking powder and baking soda. Add the flour mixture and milk, and mix until the flour is only just incorporated and a smooth batter forms. Do not over-mix. Bake in the pre-heated oven at 180 º C (350ºF) for 23 – 25 minutes or until golden brown and an inserted toothpick comes out clean. Sprinkle with white chocolate shavings (or any sprinkles of choice). Swoon. The afternoon snack attack is hitting me SO hard right now. Need to make these ASAP! Thank you, Valya, glad you like them!